I have purchased a Color Nook. Don’t get excited, people. It’s not like I’ve become decisive, or anything. No. Here is the plan. 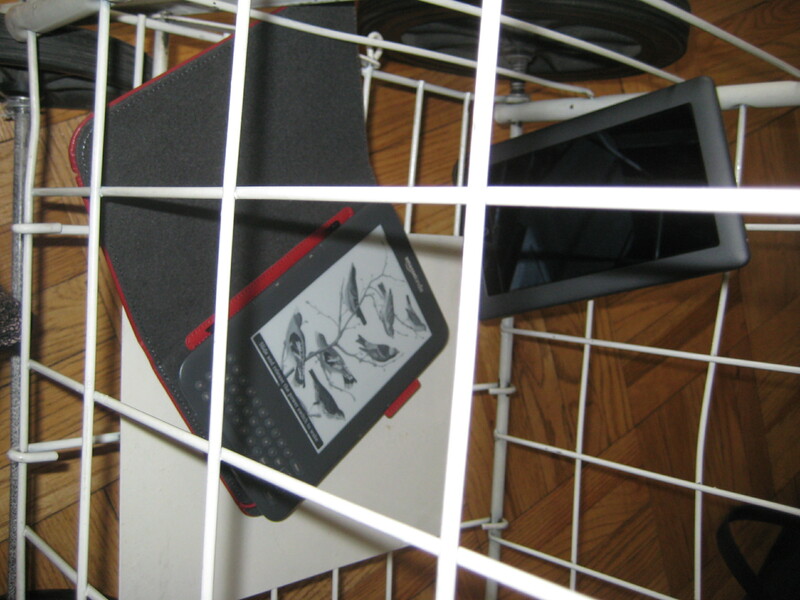 I have been test-driving the Kindle, and there are many things I like about it. So it’s only fair to give the Color Nook a chance for a road test as well. I can return it within 14 days for a refund. 2 E-Readers Enter! The "cage" is my laundry cart. Tina Turner was unavailable for comment. A bit cheating, as the Kindle I’ve been experimenting on came pre-set with my parents’ settings. But I’m not loving the setup for the Nook. I had to Google how to put my eNYPL Adobe Digital books on it. (Treat it like a USB device, attach computer). And now I cannot download FREE Nook books without entering a credit card number, which is finicky to do, hunting and pecking numbers on a touch screen. Free books, people, what do you need my credit card for? Not entirely loving the “enter credit card number, on device I might be returning…” idea. But I have books, so time for the next test! ← Road Testing a Nook, and the NYPL!